If you’ve been reading for a while, you know that I’ve been working in the media room in my basement. 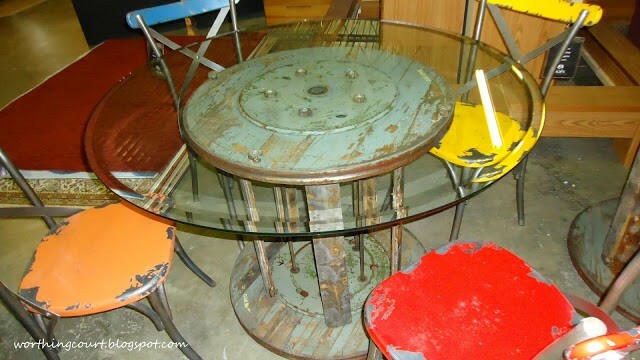 One of my favorite additions is this cool rustic/industrial table. I’m letting you have a little peekaboo at some of the other changes. 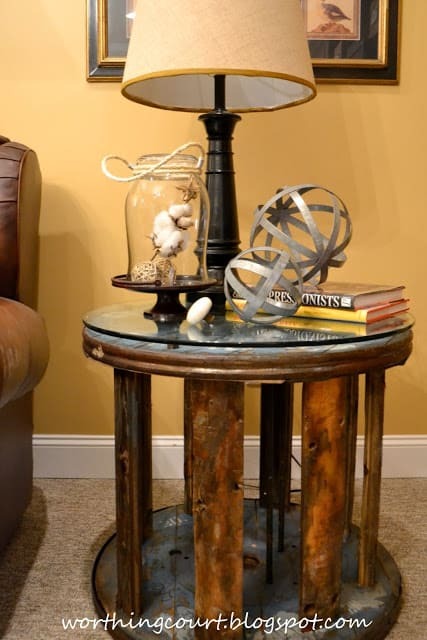 I’ve been creating a rustic vibe in the media room with a little bit of industrial thrown in so this table fits the bill perfectly! 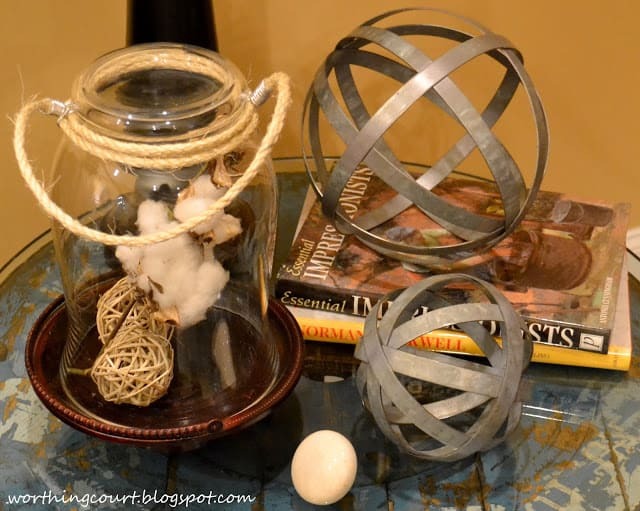 I just love these metal orbs that I found at Target. Pookie was amazed at how fast they jumped into my cart. 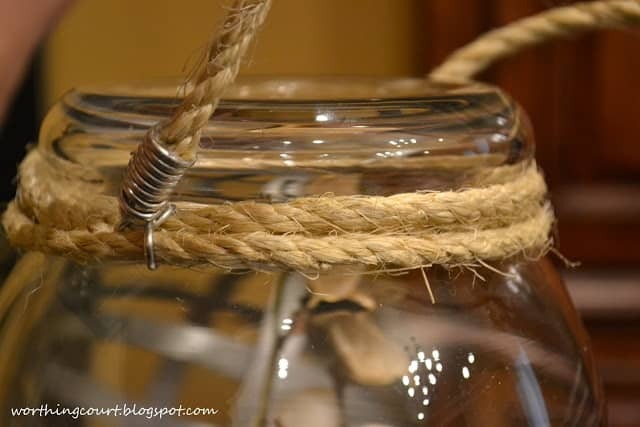 I used a glass container that I already had on hand to create a cloche and gave it a rope handle. It’s easy to see how I did it if you take a closer look. My “handle” is purely for looks only though. Take a look at the chipped blue paint and old print on the tabletop. Love! 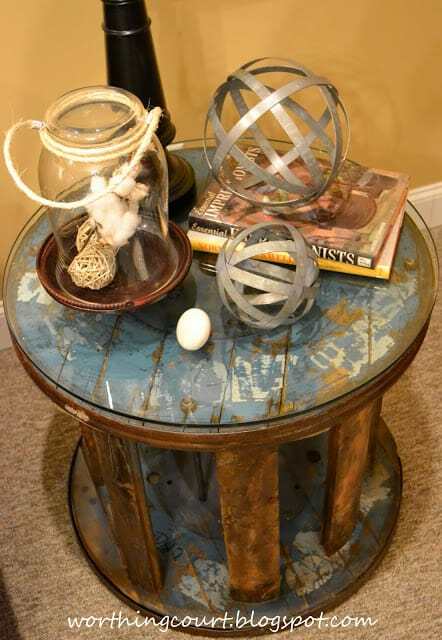 This table is made from a vintage spool that was found in an old mill in the foothills of North Carolina. The spools from this plant are dismantled and rebuilt using the original parts, while preserving the original colors and printing that shows dates and locales. I bought this table from Jeremy and Sharon, who are the owners of Sample Studio/High Point Liquidators. Some of you will remember the two group shopping trips that we went on to his warehouse in High Point, NC where they sell Furniture Market samples. They have several styles that are available for purchase ranging from $50 – $300 (not including the glass). Check out some of the ones that they currently have on hand. 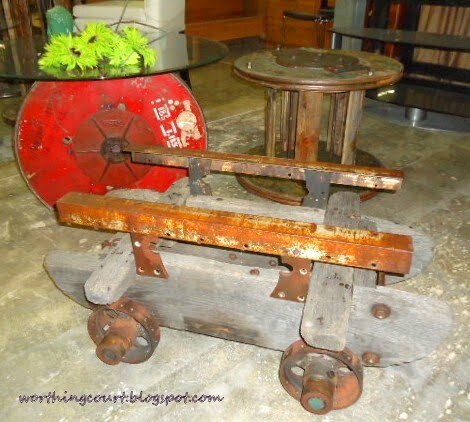 And just ask me what I’d give to have one of these antique carts! Let me know if you’re interested in obtaining one of these and I’ll send you Jeremy’s contact info. 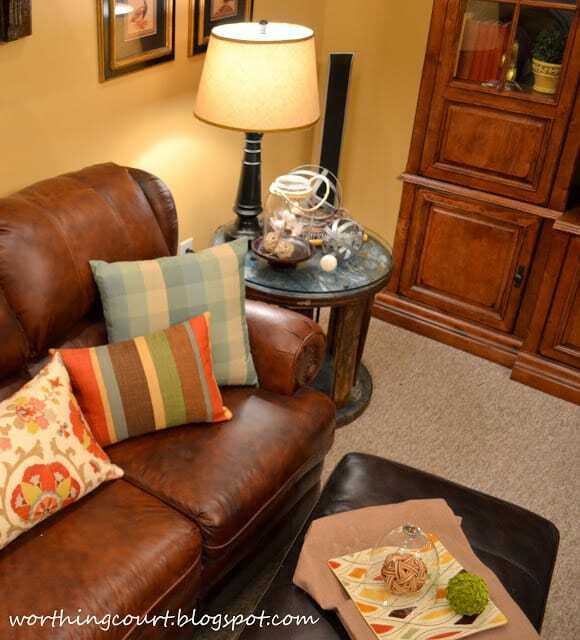 You can see more of the changes that I’ve made to the basement by clicking here. It looks great Suzy! I love seeing the old spools transformed into functional furniture. Love, love your table Suzy and great cloche! !…Hope Jeremy’s place is on the agenda for the HIgh Point weekend!…would love to finally be able to shop in his great showroom! Looks great to me Suzy. I too, love that old cart. 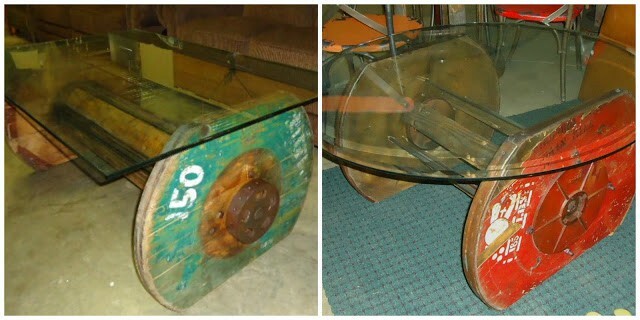 they make awesome coffee tables.You are so creative. Suzy I think this table and the other ones you showed are great. I would like the pub one. Lovely vignette on the table also. 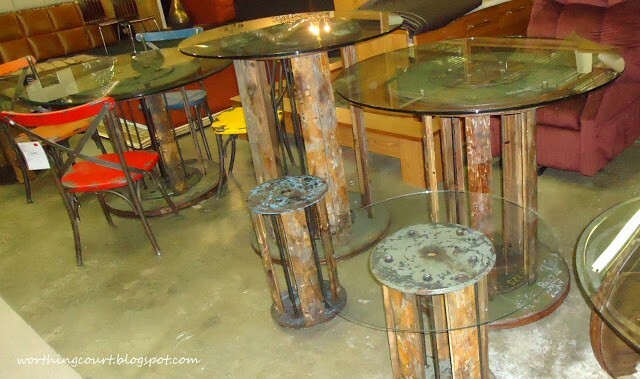 Those are the coolest tables … ever, Suzy! I love the one your chose for your awesome media space! And, of course, I love the “sneak peeks,” but I want a FULL reveal! Suzy, do not tease us like this! We want to see the rest of the room. That table is great and fits in your space perfectly. Cannot wait to see the full tour! 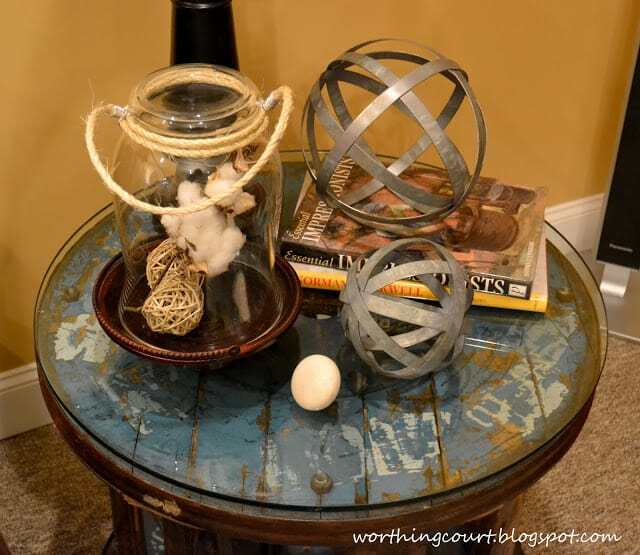 Suzy I love how unique your table is.The vignette on the table also adds so much.You put it together so well.I’m looking forward to seeing the finished room. What a cool table! 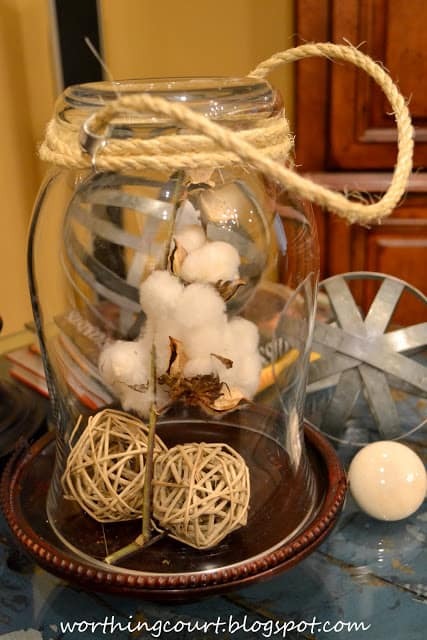 And you know I love love the jar cloche! I’m definitely going to make me one. Okay….did you just find those metal orbs at Target? I need them!!!!! Love the table, too! Why yes, Karianne. They sure did! Love your table. It’s so perfect for your media room!! 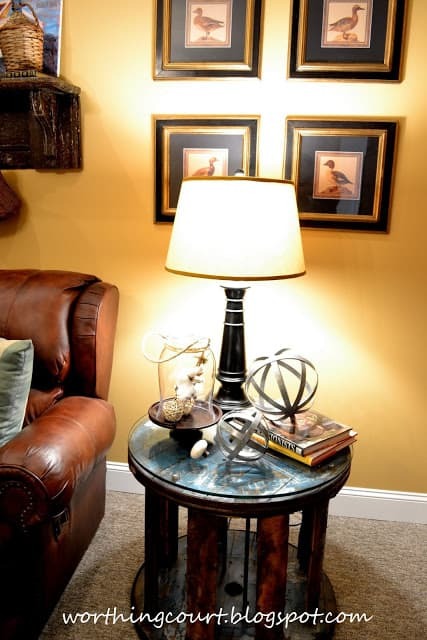 Love the look of your basement room and that is a really cool table. Yours is my favourite of them all and not just because I love blue lol. It is very unique and the table vignette is attractive too. Thanks for sharing.